We visited here for an evening meal with friends. 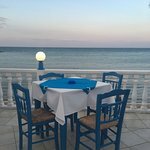 Located right by the sea this restaurant looks like a typical Greek restaurant as the decor is all blue and white. 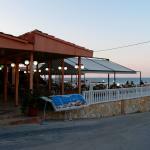 The is an extensive choice of traditional Greek food and seafood all at very reasonable prices. The service and food was faultless. I would highly recommend. Wow! What a restaurant!! 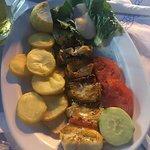 Traditional Greek restaurant, family run by a fantastic team. 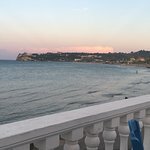 We ate here for lunch and loved it: the food, the beautiful location on the beach front, so we came back the same day for dinner!! And wow! We had the sea bass - beautifully fresh (you choose your fish from the ice display and can clearly see its freshly caught from the clarity of the fish’ eye) and cooked to perfection. 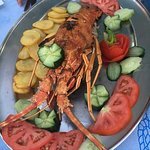 The service was the best we received throughout our stay: from start to finish they made us feel welcome, and gave us the complete Greek hospitality. Highly recommend this restaurant. Came here last night as a bit of a change and so glad we did. The location is absolutely beautiful, metres away from the sea and overlooking Tsilivi and beyond. We opted for the grilled swordfish and it was amazing - freshly caught earlier in the day by the owner himself! Not had swordfish since we went to the Caribbean 17 years ago and it was on a par, if not better. Even my daughter loved it and the closest she normally gets to fish are from Captain Birdseye (other fish fingers are available). Prices very reasonable as was the wine. Highly recommended and we will definitely be coming back before our holiday ends. 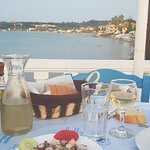 Friends of ours visited this restaurant last year on their trip to Zakinthos and highly recommended it. 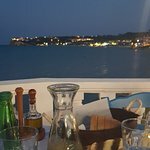 I am so glad we went because it was very good food and the restaurant overlooks the water and has a very “Greek island” feel. Everything was delicious and we would definitely go back. We go here at least once every holiday in Tsilivi, the restaurant does lovely food and the staff are very friendly and nothing is to much trouble great food, great service and great staff. 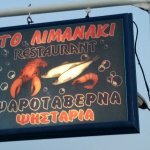 Been to Limanaki Restaurant? Share your experiences!